Hard work and perseverance are two traits that do not always add up to instant success. Paying his dues by performing on the streets of Los Angeles wasn’t easy but the dividends have paid off for singer-songwriter Andy Grammer as he brought his Spring Tour to The Gallagher Center Saturday evening. Joining Grammer for the evening were the band Parachute and talented singer/songwriter Andrew Ripp who opened the show. Grammer has made quite a few appearances around the Western NY area over the past few years. The last time I witnessed Grammer was as an opener, so it was with great intrigue to watch him as a headliner. I already knew with bassist Zach Rudolph and drummer Mike Baker among his band that they would be a solid unit. Grammer started off the eighty minute affair with his huge radio hit “Keep Your Head Up” which caught the attention of the crowd from the get-go. Grammer bounced back and forth between guitar and keyboard for the majority of the show which helped keep the show vibrant. His ability to keep things fresh goes back to his chameleon like songs as he goes from rock to pop to hip-hop and everything in between. From the beat boxing flavor of his cover of Snow Patrol’s “Chasing Cars” to the delicate sounds of the elegant “Miss Me”, Grammer displayed a few of the different elements of his music. In the midst of completing his soon to be sophomore release, Grammer did manage to give us a taste of his new music. Fans were treated to “Crazy Beautiful” and “Kamikaze”, two tracks which seemed to go over quite well with the receptive crowd. Having toured with many diverse artists, it certainly helped get his music out there for people to hear. While it has been a long hard journey, Grammer is now at the forefront of music industry as the world awaits for his next release. 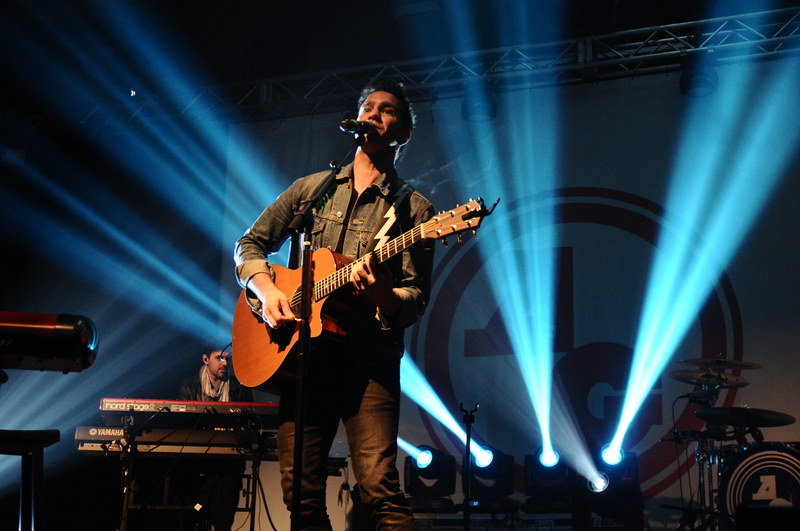 Expect more great things to come in 2013 from Andy Grammer. Parachute, the five piece band from Charlottesville, VA featuring Will Anderson (vocals, guitar, keyboard), Johnny Stubblefield (drums), Alex Hargrave (bass), Kit French (sax, keyboard, vocals) and Nate McFarland (guitar, vocals) helped warm up the crowd. The band quickly went through a forty-five minute set that featured well known tune “Kiss Me Slowly” as well as the bands latest single “Hearts Go Crazy”.